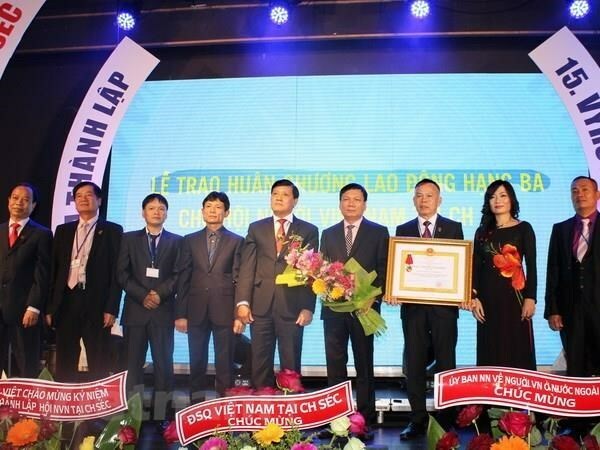 Hanoi (VNA) – The Vietnamese Association in the Czech Republic plans to hold its sixth congress and a ceremony marking its 20th founding anniversary in this October. During a regular meeting of its executive board on April 14, the association reviewed its operations in the past six months. One of the association’s biggest achievements far this year was helping the Vietnamese Students’ Association in the Czech Republic hold its expanded executive board meeting to complete its organisation and sketch out plans for its operations, especially in coordinating with the government of Plzensky province to promote Vietnamese culture and Vietnamese language teaching. The association also sent delegations to visit the European Parliament and Truong Sa (Spratly) archipelago. Along with preparing for the sixth congress and the 20th founding anniversary, the association will get ready to welcome Prime Minister Nguyen Xuan Phuc who will visit the Czech Republic from April 16-18. Addressing the event, Ambassador to the Czech Republic Ho Minh Tuan lauded the performance of the association over the years, suggesting it pay greater attention to personnel training. He pledged that the embassy will coordinate closely with the association in organising the sixth congress and the 20th founding anniversary. Stressing the significance of the upcoming visit by PM Phuc, the diplomat said the visit is to take place in the context that Vietnam and the Czech Republic are preparing to celebrate the 70th anniversary of bilateral diplomatic relations. The visit aims to foster traditional ties between the two countries, and continues the series of high-level visits by leaders of the two countries in recent years. The visit is expected to lift bilateral relations to a new height, especially in economy, trade and investment through the seeking of measures to give optimal conditions for ministries and businesses of both sides to strengthen their cooperation, he said.